Employment in creative occupations in the Tucson Metropolitan Statistical Area (MSA) was below the national average in 2017, at 112.2 jobs per 1,000 residents. The national average was 131.8. 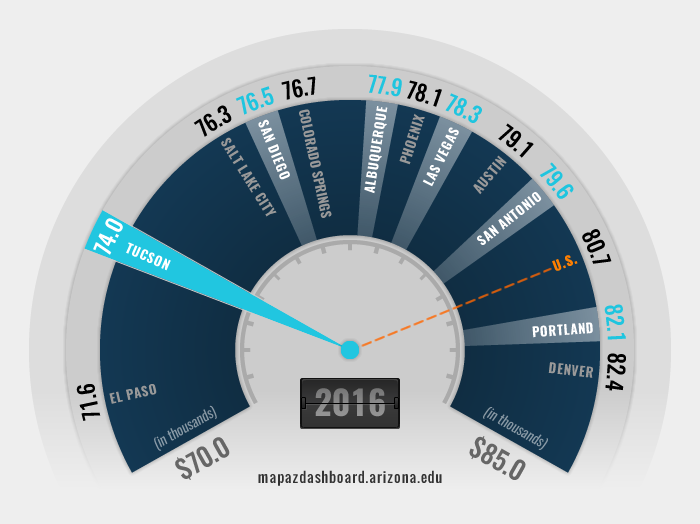 Further, Tucson ranked 10th out of the 12 western metropolitan areas. Salt Lake City ranked first with 190.6 jobs per 1,000 residents, while El Paso ranked last with 88.3 jobs per 1,000 residents. Employment per resident in creative occupations decreased slightly in Tucson between 2012 and 2017. Wages per worker in creative occupations for Tucson averaged $73,431 in 2017, which was 10.7% below the national average of $82,233. Tucson ranked 11th out of the 12 metropolitan areas. Creative workers in San Diego earned the highest wages in 2017, at $90,669, while workers in El Paso earned the least, at $64,652. Workers in creative occupations are engaged in the creation of new ideas, technologies, and expressions. Thus, they are an important part of the innovative process driving local growth. The creative class, as defined by Richard Florida, includes both the super creative core and creative professionals. The super creative core is composed of computer and mathematical occupations; architecture and engineering occupations; life, physical, and social science occupations; education, training and library occupations; and arts, design, entertainment, sports, and media occupations. Creative professionals include management occupations; business and financial operations occupations; legal occupations; and healthcare practitioners and technical occupations. Employment in creative occupations in Tucson hit 114,730 in 2017, which accounted for 31.4% of total jobs. That was similar to the national share of 30.1%. In Tucson, employment in creative professional occupations was 62,590 in 2017, while the super creative core employed 52,140. That translated into 61.2 creative professional jobs and 51.0 super creative core jobs per 1,000 residents. Tucson lagged behind the nation for both the creative professional and super creative core occupations. Average wages earned by workers in creative occupations in Tucson was $73,431 in 2017, well above the all-occupation average wage of $46,140. Average wages in creative professional occupations were $79,697 and those in the super creative core earned $65,909. Within the super creative core, average wages in Tucson were $65,909 in 2017, 4.5% below the national average of $69,036. 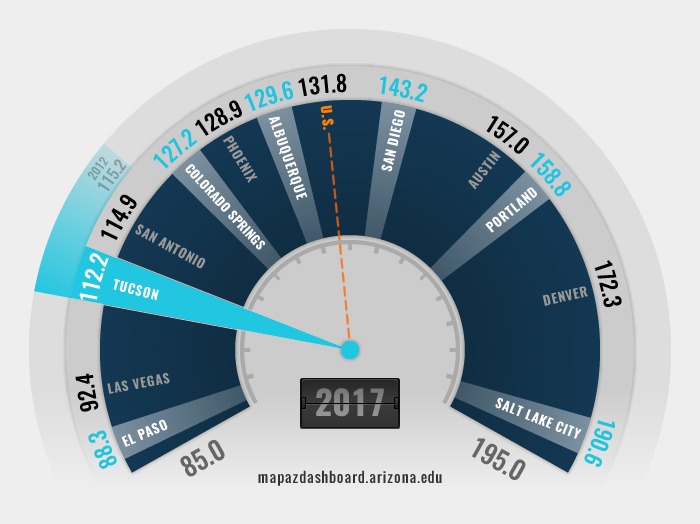 In 2017, Tucson super creative core wages ranked eighth out of the 12 western metros tracked on the MAP Dashboard. Data for the metropolitan areas is available on the Creative Occupations Comparison Page. In 2016, the wage for creative occupations in Tucson was $70,869. This ranked Tucson 11th among peer western metropolitan areas. Tucson’s cost of living was 4.2% below the national average. After adjusting for the cost of living, creative occupation wages in Tucson increased slightly to $73,975. However, this increase was not enough to offset the higher wages and relatively low cost of living found throughout the peer western metropolitan areas. Employment growth in creative occupations in Tucson has declined overall during the past decade, falling from 12.9% between 2002 and 2007 to -0.1% between 2007 and 2012, and then increasing to 4.2% growth between 2012 and 2017. The U.S. growth rate in creative occupations more than doubled during the past five years, increasing from just below 5.0% to 11.1%. The employment growth in creative occupations for Arizona almost tripled between 2012 and 2017, increasing from 5.3% to 14.5%. The reduction in growth in Tucson’s creative occupations can be attributed to declines in employment in the super creative core, especially architecture and engineering occupations. Growth rates for the super creative core and creative professionals are available on the Creative Occupations Comparison Page. Creative occupation wages have increased between 2002 and 2017 for the U.S., Arizona, and Tucson. Wages in the U.S. during this time increased by 44.7%, while the state of Arizona and Tucson’s creative occupation wages increased by 44.1% and 45.9% respectively. Tucson’s current creative occupation wage of $73,431 is nearly $10,000 less than the nation. After reviewing several definitions of creative occupations, the MAP team decided to follow the widely accepted definition given by Richard Florida in his book “The Rise of the Creative Class”. The creative class, or creative occupations as referred to on the MAP, is broken down into two sub-groups: the super creative core and creative professionals. The occupations are defined by the Standard Occupation Classification (SOC) system, a federal statistical standard used by federal agencies to classify workers into occupational categories for the purpose of collecting, calculating, or disseminating data. The list of creative occupations (below) are the names given by the SOC. To view a detailed breakdown and definition of each occupation visit the SOC on the Bureau of Labor Statistics webpage. The detailed employment and wage data come from the U.S. Bureau of Labor Statistics, Occupational Employment Statistics (OES) survey. The U.S. Bureau of Labor Statistics collects survey data on wages by occupation and industry. The OES data include detailed employment and wage estimates for over 800 occupations and industries. Occupational wages are measured before taxes and do not include fringe benefits. The cost of living adjusted data comes from the Bureau of Economic Analysis Regional Price Parities (RPPs). The RPPs are indexes that allow the comparison of prices across regions.